Quartz. 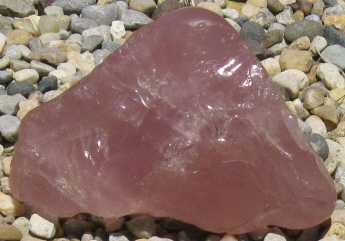 Apart from feldspar, no other mineral in the surface layer of the earth is as abundant as quartz. 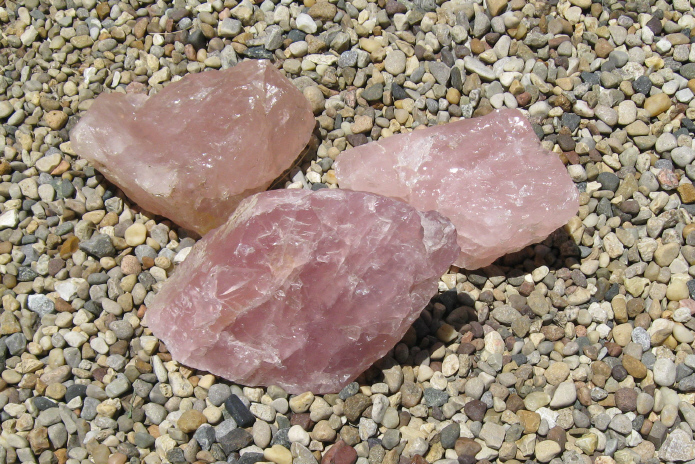 Chemically, quartz is silicon dioxide and is also called silica. Its name comes from the German word quarz, which is said to derive from Middle High German twarc, which, in turn, may've originated from a Slavic word or words with the meaning of "hard." And quartz is hard. The "z" of quarz in German, is spoken with a "ts" sound (e.g., Mozart [Moht'sart] ), which may be the reason for the "t" in quartz. It's seen here in crystalline form. Note the icy look of the various specimens. One account says the word crystal goes back to Greek crystallos, deriving from the word for "ice cold," krysos, because originally it was thought that crystals were an ice "so cold it would never melt." Another account says that krystallos meant "clear ice" to the Greeks, and yet another, that kryos was Greek for frost,"so they called these patterns of snow and ice, 'krystallos'." 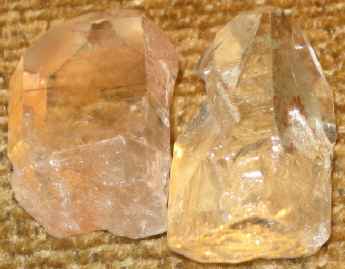 The crystal cluster below, to the left, was broken and mended, but the diagonal fracture is still visible. 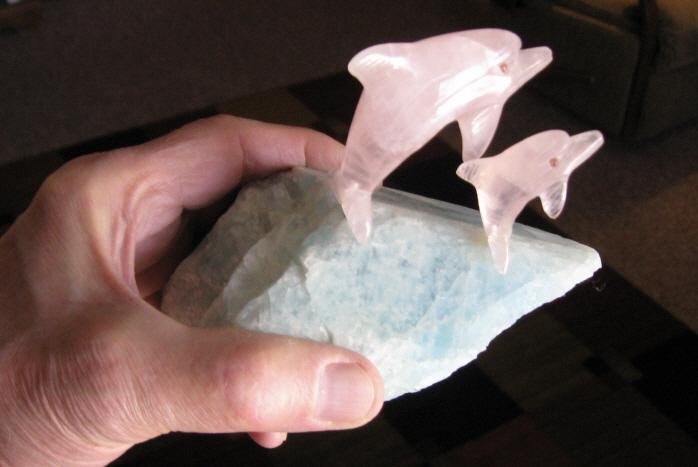 Rose quartz dolphins on an aquamarine base, an original Peter Müller carving. The color appears lighter as are the pieces below. 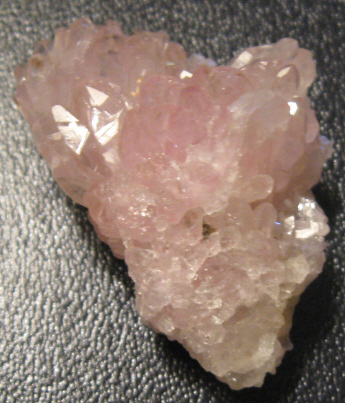 Rose quartz is also silicon dioxide ( SiO2 ) and its coloring agents are manganese and titanium. 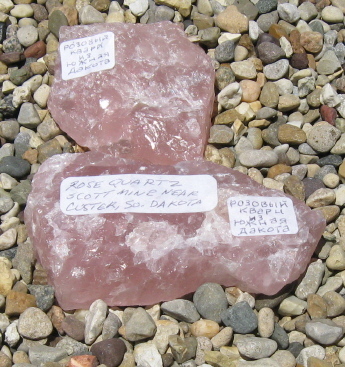 A source of rose quartz in this country is the Scotts Red Rose Quartz mine, southwest of Custer, South Dakota. The open face quarry is operated by Carl Scott, the great grandson of Samuel Scott, a mining engineer who built the first cabin in the Black Hills in 1876 and who was a founder of Rapid City. In 1893 Samuel moved to Custer and worked many mines in the area including the present claim. 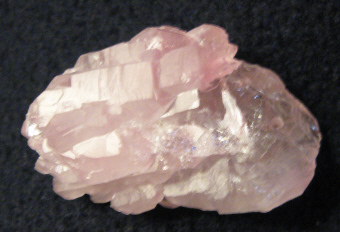 Rose quartz is the state mineral of South Dakota. 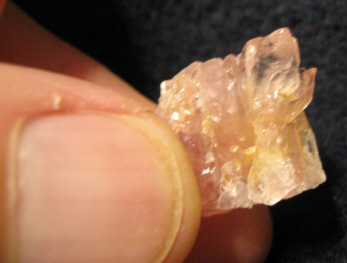 Most often it is seen in chunks and is "often crackled" but it does occur in crystal form. The crystals I've seen, are small. The specimen directly below is pictured larger than it's real size; it's around an inch and a half in length. In the photo above, you can easily tell the true size of the specimen. However, the one to the right is again pictured larger than it really is. 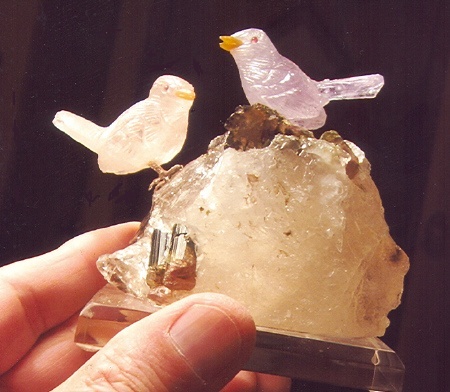 The two birds on quartz with tourmaline are from South America. 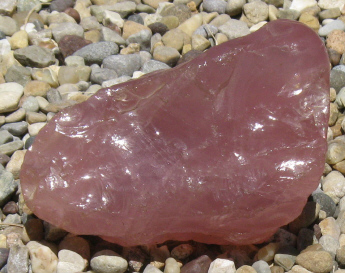 The one on the left is carved from rose quartz, while the one on the right is made of amethyst. 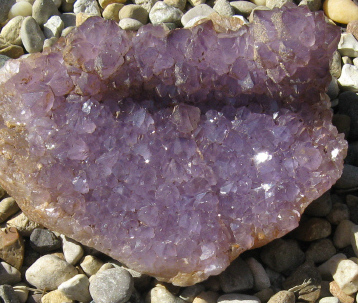 Amethyst is the most valued of the quartz rocks, but its color here is pale compared to other specimens of a purple hue. 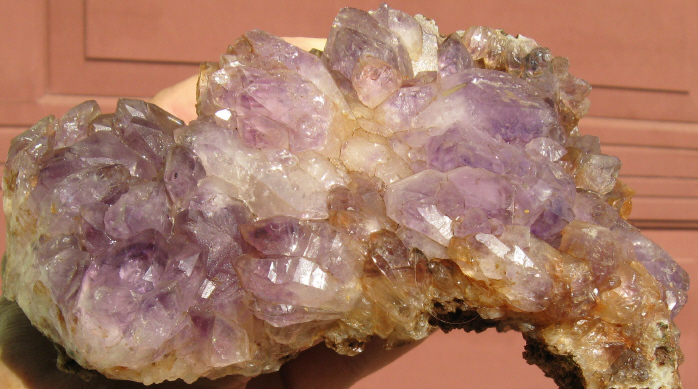 The name amethyst is from Greek and means "not drunken." It "was worn as an amulet against drunkeness." And, according to Isaac Isimov in Words of Science, it was said an amethyst cup would never intoxicate. The Greek a was used as a negative and methyein meant intoxicated: hence, amethyst. The word methyein came from methy meaning wine. According to the foregoing, I could humorously say the amethyst bird won't fall down drunk, but it has only "lite" protection. 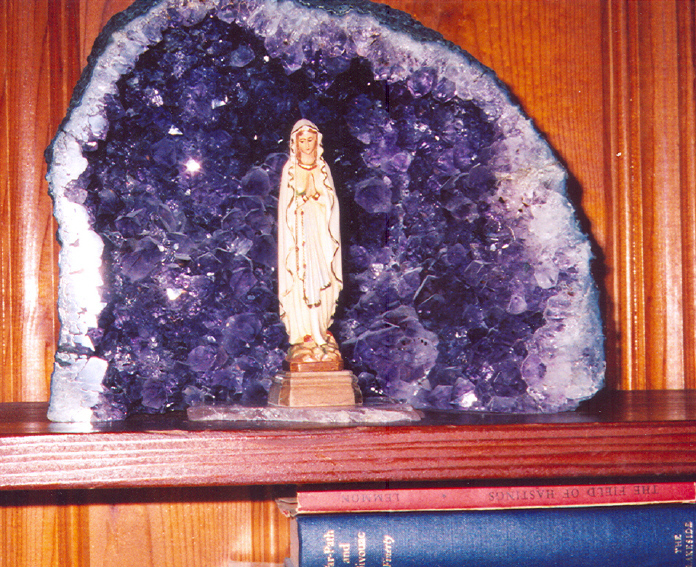 A geode "grotto" of amethyst crystals in our den, with a little statue of the Blessed Virgin Mary standing on a slice of rose quartz. 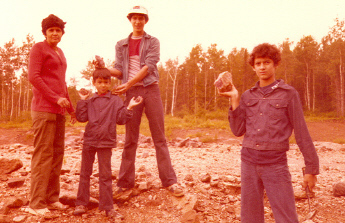 My family, then younger, at an amethyst mine in Canada (lst photo, left to right: my wife Serafina & sons Aaron, Shaun and Shane). 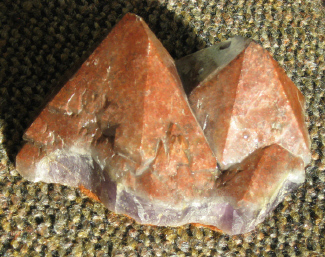 Other specimens of amethyst below with medium and light purple coloration. 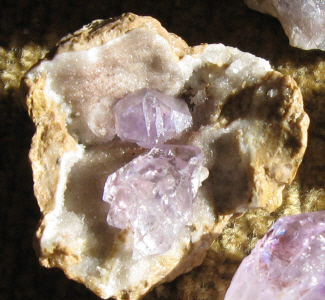 Note the one that has crystals, formed as if they are lying in the geode. There's a little open space under them. 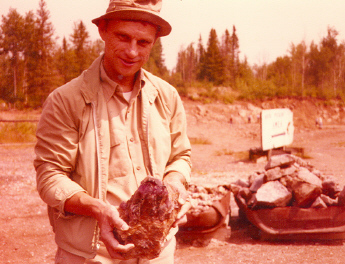 Though looking larger here, the geode is little, an inch and a half long. 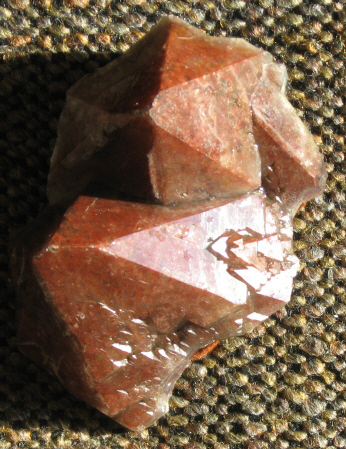 Two pictures of reddish crystals with the one on the left showing the structures on the side more clearly than the photo on the right. The reddish color may be from a greater concentration of iron. The one on the right reminds me of little pyramids with a purplish layer below them. If you want to use a little imagination, you can play with the idea of a Purple Nile flowing by these edifices of Egypt at sunset. There is a Blue Nile and a White Nile, both tributaries of the Nile. 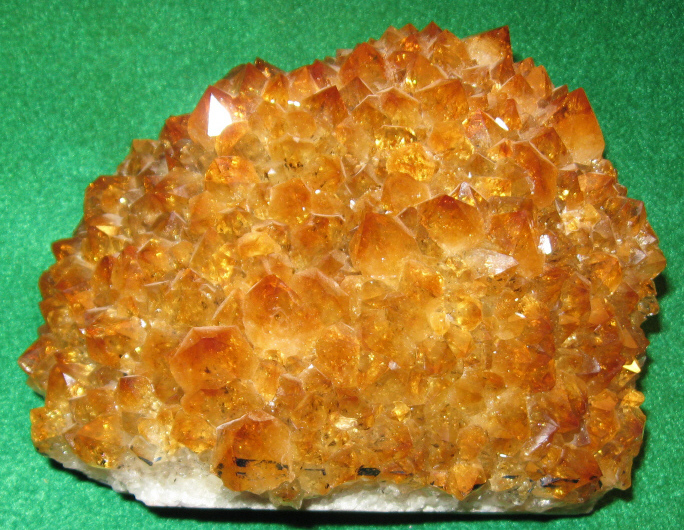 Citrine cluster. According to one source, the name citrine comes from the French word for lemon, citron (lemonade in French is citron pressé), while another source says it's from the Latin citrus, the citron tree. It seems to me both could be true, in that French traces to Latin. The name itself goes back to the 14th Century. Its color ranges from pale yellow to madeira orange. 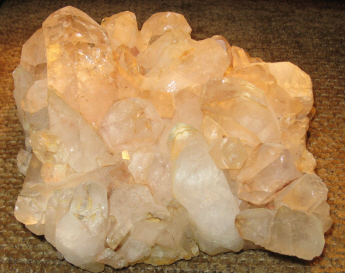 Citrine is a variety of quartz and the yellow color is from iron being present. It will change its color if it is exposed to sunlight for a few hours. Jewelry made of it should be kept away from heat or strong light. It is a semi-precious stone and is rarer than either amethyst or smoky quartz, both of which can be heated to change their colors to that of citrine. Citrine is valued for resembling topaz which is rarer. On the Mohs Scale of hardness from 1 to 10, quartz is 7 and topaz is 8.